Oprah and Dave: Ultimate Odd Couple watch Lovie, profess love. I. The day's best spot lasted just 10 seconds and was a closely guarded secret. 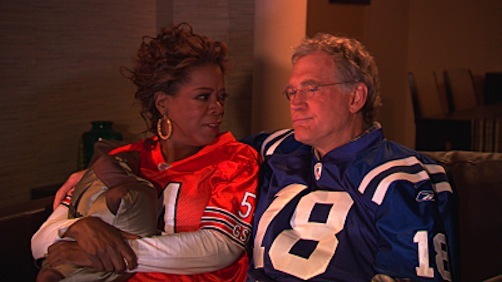 So you might have missed David Letterman and Oprah Winfrey snuggle-bugging during the first half of Super Bowl XLI. "You want the Bears and I want the Colts, but we both win because we're in love," Dave said in extreme closeup while stuffing his yap with chips. The camera then pulled back to reveal Oprah sitting next to him on a utilitarian brown love seat. "Honey, don't talk with your mouth full," she good-naturedly admonished him. "Oh, sorry," he said as the Late Show with David Letterman logo popped into view. Oprah wore a No. 54 Brian Urlacher jersey with Dave displaying Peyton Manning's No. 18. CBS says the spot was covertly filmed on Jan. 24 at Late Show's Ed Sullivan Theater in Manhattan. Letterman had baited and ridiculed Winfrey to no avail until she finally appeared on the Dec. 1, 2005 Late Show, marking her first appearance with him in 16 years. Dave graduated from Ball State University in Indiana and Oprah originates from Chicago. II. Credit Prince with having game. 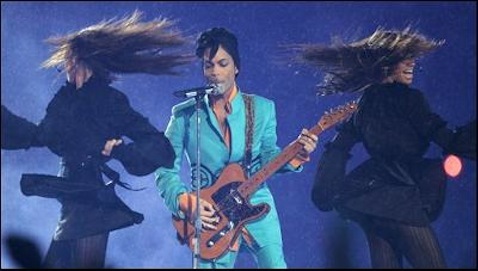 He energetically performed his halftime show under duress in a pouring rain, finishing it off with Purple Rain. Not sure if he was really playing the guitar, and he might have been lip syncing, too. Still, he carried it off pretty seamlessly in the midst of pyrotechnics that seemed damned dangerous under such conditions. His hair never gave an inch, though. III. Budweiser made the biggest commercial investment with eight different 30-second spots. Favorite: The wedding day bit in which guys thirsting for Bud hire a fast-talking auctioneer to speed up the marriage ceremony. "Do I hear an 'I do, I do?' Do I hear an I do?' "
Rex Grossman's gaffes included botched snaps and interceptions. IV. CBS announcers Jim Nantz and Phil Simms too often seemed a step slow Sunday. They were in early denial about the rain, which helped cause a couple of quick turnovers. But you might have thought it was a beautiful day until Simms finally acknowledged he'd been wrong in saying that "the rain would not be a factor in the game." As an oft-opinionated, former Super Bowl winning QB, Simms should have lashed Bears signal-caller Rex Grossman for handing a close game to the Colts with two very poorly thrown interceptions in the fourth quarter. Alas, both announcers seemed loathe to point out the obvious until Bears fans long since had stopped throwing bricks through their TV sets. Namely, that Grossman plain and simply buried the Bears just after it seemed they had seized the momentum. V. Simms did get off a cheeky one-liner after CBS cameras captured David Spade and Patrick Warburton watching the game from the stands and in the rain. They're co-starring in the network's new Rules of Engagement sitcom, which premieres Monday. "If the show was a hit already, they'd be in a suite," Simms said. VI. Nantz contributed a fun anecdote about Colts coach Tony Dungy, who makes it a point of not raising his voice and never swearing. But the team's longtime PR director once caught Dungy verbally agreeing to appear on Fox's The Best Damn Sports Show Period, Nantz related. So much for four-letter words. Coach Dungy and Colts owner James Irsay put God on their side. VII. OK, maybe Grossman didn't have a prayer. But did God really care who won the Super Bowl? Colts owner James Irsay and Coach Dungy both put the Supreme Being in their huddle during post-game victory remarks. 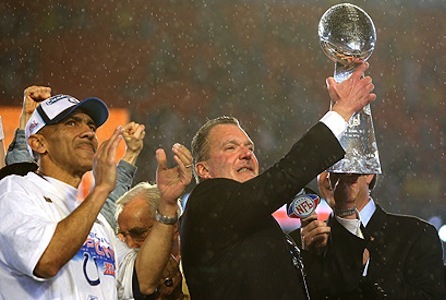 Irsay proclaimed, "I know that God has looked after us on this journey." And Dungy said he told the team, "This is going to be a storm. The Lord doesn't always bring you directly through." He also credited the Colts with "doing it the Lord's way." Good Lord, isn't that laying it on just a bit thick? VIII. Those godaddy.com commercials aren't inventive, cute or daring. They're just sleazy and tiresome. The latest, played three times Sunday, included glimpses of wild partying by the company's marketing division. Go away, godaddy. Ya bore us. IX. CBS tried to put some oomph in Katie Couric's Evening News ratings with promotional spots in which she talked up a series of reports about good Americans doing great things. Nice sentiment, but b-o-o-o-ring. X. The network's pre-and post-game show quartet included two quarterbacks, Dan Marino and Boomer Esiason, who played in Super Bowls without ever getting victory rings. Esiason had bragging rights on the pre-game picks, though. He said the Colts would win 31-17. Actual final outcome: 29-17 in favor of Indianapolis. Score!! !